Two-Day Trip to Edinburgh: What To Do and See — . The thing I will remember most about my trip to Edinburgh is the charm of its people. Starting with our first cab driver who gave us a layout of the city (Old Town v. New Town); the friendly local who recommended the best bus tours for first timers in the city and shared a few jokes with us; and the random stranger who offered to pay for my coffee. The heart of any city is its people and with Edinburgh, I left inspired by the kindness we experienced. I cannot write about visiting Edinburgh without commenting on its beauty. The city looks like a replica of some of the world's most beautiful paintings. It's defined by stellar architecture, beautiful gardens and amazing views. It's natural beauty is breathtaking and left me in awe by its splendor. We stayed at B+B, Bed and Breakfast. I found this gem via Trip Advisor and booked after reading the great reviews. Along with the old school charm, chic and modern decor and the amazing customer service, B+B is centrally located. It's approximately a 10 minute walk to Princes Street, which is Edinburgh's major high street. I wrote a mini review of B + B on my Instagram Page. Princes Street features a plethora of shops, local entertainment and restaurants. I recommended walking as much as possible in Edinburgh, there is so much to see by foot. Since we were visiting for only two days, we focused our trip on exploring and getting a feel for Edinburgh and its main attractions. The first day, we visited Princes Street Garden, which is an oasis in the centere of the city. The garden itself is beautiful and serene and there are tons of bench chairs to relax and enjoy the view. The garden also offers amazing view of Edinburgh Castle, which overlooks the city. We then visited Jenners Department Store where we admired the beautiful Victorian architecture. The next day, we enjoyed a tour of the city with a Hop on and Off city bus tour. Stops included the Queen's Gallery, Arthur's Seat, the Royal Mile and Edinburgh Castle. We previously decided we wanted to see Edinburgh Castle and the Royal Mile. 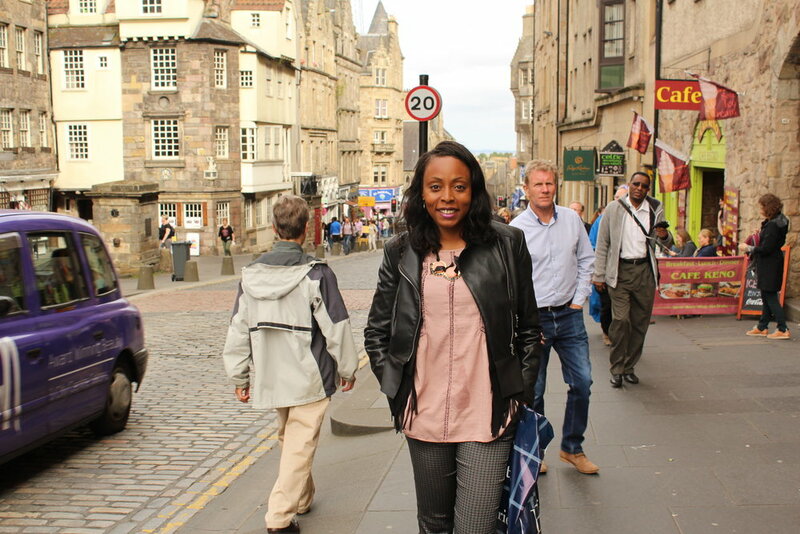 The Royal Mile is a historic street lined with Scottish architecture, cafes, restaurant, and shops. We first visited the castle, which is expansive, so give yourself time to explore! After touring the castle and lunch, we walked the Royal Mile downhill to the Queen's Gallery. Quick tip, if you like whiskey or have people in your life who do, visit the Scotch Whisky Experience, which is just outside the castle gates. After sleeping in and having breakfast, we spent the last day of our trip shopping at some of my favorite UK department stores (Topshop and River Island anyone?) and buying a few souvenirs and gifts. Did you vacation this summer? Where did you go?